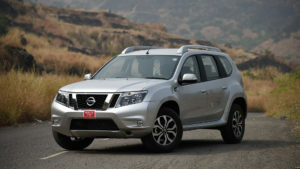 The Nissan Terrano is the third model in the Renault-Nissan India line-up to receive the badge-engineering treatment. However, this time, it’s Nissan that is tweaking a Renault product rather than the other way around. Unlike the other two badge-engineered models in the Renault-Nissan stable – the Scala and the Pulse – both of which have got mild tweaks to their exteriors to differentiate them from their Nissan equivalents; Nissan has gone a step further with the Terrano and made significant styling changes, including heavy alterations to the sheet metal. These include redesigned bumpers and lights and a new grille, all of which help the Nissan Terrano look like a proper Nissan. And there’s no doubt that the company has got a winner in the looks department. The Nissan Terrano’s revised V-shaped bonnet integrates nicely with the new Nissan-family grille. The grille itself looks inspired by the larger Nissan Pathfinder SUV sold internationally. The front bumper and lights are new, and the detailed styling around the fog lamps gives the Nissan Terrano a striking look when viewed head on. Dimensionally, Nissan Terrano measures 4.33m in length with a width of 1.83m. Its overall height with the fixed roof rail is 1.67m. The wheelbase of 2.67m adds more to the interior spacing which is already abundant given its incredible height. Nissan Terrano has a ground clearance of 205mm, which is similar to that of Renault Duster, but is an add-on advantage that will keep this SUV going easily on any terrain. The side profile of Nissan Terrano has angular bold lines which are different from Duster’s curvy lines. The flared wheel-arches make the Terrano look aggressive, distinguishing it from most of Nissan’s models in India. The doors have two horizontal creases in them that enhance the butch look, but it isn’t enough to alleviate the organic lines of the rest of the car. The rear end bears no similarity to any of the Nissan SUVs and it is evident that Nissan has developed a new tail lamp cluster without fiddling too much with the Duster lamps. It gets a chrome garnish to add a premium feel, but the overall appearance is rugged with roof rails and silver skid plates. The flared up wheel arches of this SUV are endowed with a set of diamond-cut 16” machined light -weight alloy wheels in the top end variants, while the base as well as the mid variants are fitted with similar sized robust steel wheels, which certainly make the SUV look sportier. These classy rims have been further equipped with tubeless radial tyres of size 215/65 R16, which have a superior road grip on any terrain. In terms of ride, unsurprisingly, the Terrano does brilliantly. It smothers even the biggest of potholes with ease and you don’t have to slow down for rough roads. In fact, the faster you go over rough surfaces, the better the ride.As for handling, the Terrano feels very stable at high speeds and rarely gets out of shape. Even in normal driving, the handling is pretty impressive for a high-riding SUV. There is a bit of body roll due to the soft suspension setup, but it is never too much. And you always feel in control of the car. Also, when you want to have fun, the car’s direct steering is quite rewarding. It’s light enough when you want it to be and weighs up at speed, and this adds to the overall fun. Nissan Terrano Ex Showroom Price in New Delhi ranges from 9,43,520/- (Terrano XL P) to 14,03,036/- (Terrano XV D PRE 110 PS AMT) .Nissan Terrano has 5 Variants of Petrol are available in India. Nissan Terrano comes in 6 colours, namely Sandstone Brown,Fire Red,Blade Silver,Pearl White,Sapphire Black,Bronze Grey.